India is the third largest producer and consumer of chemical fertilizers in the world. Its appetite for Chemical Fertilizer has increased from 65.6 Thousand Tonnes to 2649 Thousand Tonnes between 1951 to 2010, And its per hectare consumption has gone up from < 1 KG / Hectare to 135 Kg / Hectare during the same period. Let alone consumption of chemical fertilizer went up from by 167% between 2003 to 2010. Our dependency on Chemical fertilizer inputs increased steadily from 2 Million Tonnes in 2003 to 12.3 Million tonnes in 2010. Due to no big capacity additions in domestic fertilizer production front our net imports dependence grew from 12% to 44% costing huge forex spend. Since our farmers can’t afford the fertilizer at global prices, they are subsidized by the government of India to an extent of up to ~80%. Due to heavy consumption demand, increasing price trends in global market Import bill became large and the net Subsidy bill grew to whopping 99,495 crores in 2008- 2009 from 40,338 Crores in 2007- 2008. That is 246% increase in One Year!! Already heavy fertilizer bill started to show its potential of choking the Indian budget spend figures and development activity. Coupled with popular socialist measures impact the farm productivity, uncontrolled black market for UREA fertilizers, unaccounted diversion of UREA to commercial activities and smuggling. India faced the biggest challenge of it’s time to control the fertilizer subsidy bill. Hence to reign in the Subsidy bill, Nutrient based subsidy scheme was brought in 2010-11. Which basically classifies chemical fertilizers into 2 buckets as UREA and Non UREA. Which means out of the 3 main Crop essentials that is Nitrogen, Phosphorus and Potassium fertilizers. Nitrogen commonly referred to UREA will only receive the subsidy on MRP. rest of the nutrients will be subsidized to the production units on their consumption during Production and further companies are allowed to top up their production and margins while sale to Farmer. Essentially NON UREA fertilizers were decontrolled from the Indian Market’s. As expected government was able to reduce significant subsidy burden by this, but already high Non UREA fertilizer prices went up by 6 times in the market. It created huge cost imparity between UREA and NON UREA fertilizers. Disparity among UREA and NON UREA wedge grew 4- 6X times, 267% increase in the Phosphorus Inputs, 371% increase in the Potassium Inputs!! The healthy ratio of NPK nutrient which is 4:2:1, if farmer continues to maintain the balanced nutrition then his production costs would have shot up by 199%. No wonder Inflation kicked in soon after the NBS scheme. Hence with low literacy and knowledge and implication of balanced nutrition, farmer only is trained in these years to put chemical fertiliser to produce more. Hardly he has been educated on the relevance of different nutrient inputs to be used for different crop stages. Hence for the poor farmer natural option is to buy the low priced fertiliser available that is the UREA compromising on the balanced nutrition. Since margins for the last mile trader is with non-UREA products, they created time and again virtual no stock situations at critical crop cycle, forcing the farmer to buy non UREA products or to skip the essential fertiliser dosages resulting with low yields and farm productivity. 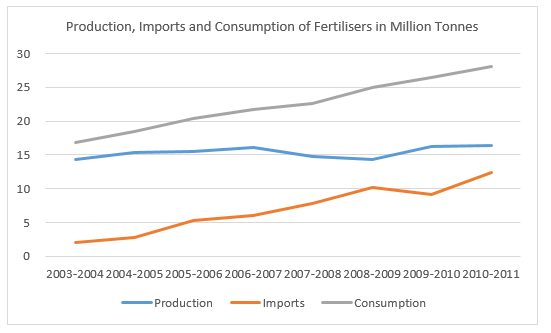 Low consumption of Phosphatic and Potassium products post NBS scheme is evident, DAP (Phosphorus) consumption was at 4.2 Million Metric Tonne at 2009-2010 which has dropped to 3.611 Million Tonnes in 2013-14, complex fertilisers has dropped its consumption from 8 Million Tonnes in 2009-10 to 6.9 Million Tonnes in 2013-14. Overall there is net negative impact to the farmer pushing his production prices higher, putting him back with the mercy of local fertiliser traders to fend himself of the required stocks, exposing him to high rate credit risk, if not being forced with the bundling UREA with the unwanted high margin nutrient’s or pesticide sales. With our inability to push up the food grain production in the last 3 years, India stares at an impending Agrarian crisis, where agriculture is no more sustainable to the farmer. So while Government seems to be a winner in cutting the subsidy bill drastically, but the same has impacted large cultivable land of India. With excess flow of Nitrogen and lac of Phosphorus and Potassium primary growth nutrients pushing India to an agrarian crisis. Its time for India also known for its technology intellectual capital to help adopt technology at fast pace to understand ground realities and devise provisions for apt technological interventions to quickly recover from the crisis which otherwise staring at us. On the ground execution excellence would matter. NubeSol Technologies is one such company founded to make a positive impact on agriculture. We monitor farm lands at large scale using satellite based remote sensing technology and use data analytics technology platform to study, measure, analyse and advise for pin pointed actions on the ground to improve the yields. 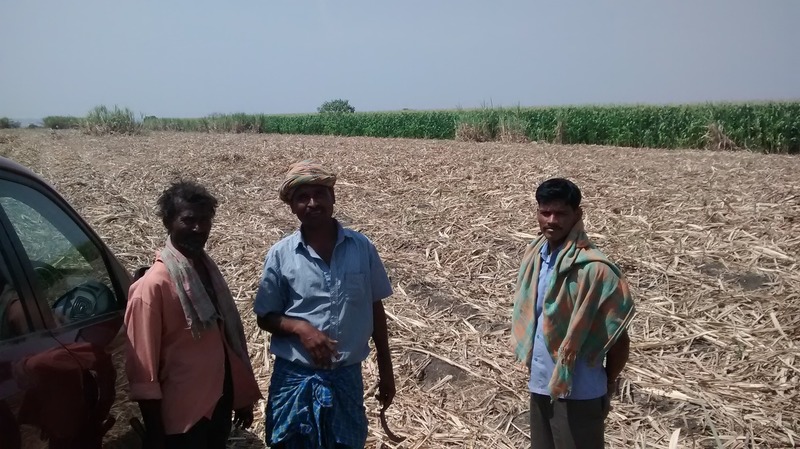 Through precession inputs to the farmer on the low yielding areas, precision recommendation on quantity of inputs appropriate to the Crop cycle, can save farmer of huge input costs while increasing the productivity.